Adams started with the ball at their 28 yard line. Maurice Swain Jr (24) got the first carry for a 2 yard gain. Anthony Patritto (3) was stopped for no gain. On 3rd-2, QB Carter Farris (10) took the shotgun snap and found Patritto with a nice touch pass on a shallow post that went for 23 yards to the Eagles 47. Farris kept it on the read-option on first down, cutting up behind a nice block by his right tackle, Conner Hess (78); gain of 6. Nico Jackson (21) got it next, and he used a block by pulling guard Reed Vogt (79) to slice though the line and bounce it across the grain for 11 yards and a new set of downs at the Eagle 30. But the Highlander drive would stall there. Nick Traficante (34) was stopped for no gain, then Farris was sacked for a loss of 6. On 3rd-16, Patritto couldn’t coral the Farris pass on a short out. On 4th-16, Farris looked for Jack Bishop (5) on the slant pattern, but a nice defensive play by Lakeland’s Leo Skupin (2) broke it up. Lakeland took over on downs. After a false start made it 1st-15, Logan Kania (44) dropped the Eagles halfback Robbie Tracy (21) after a gain of 2. Tracy got it again and picked up 7 behind his big offensive line before Ryan Rifenberg (9) made the stop. 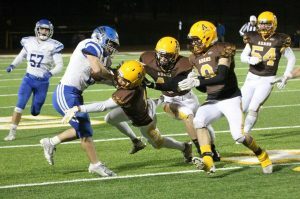 Anthony Rossi (10) got the next carry and picked up 9 yards before Logan Sayre (27) made the tackle. Lakeland, running a deceptive wing-T style offense, gave it to Tracy again. 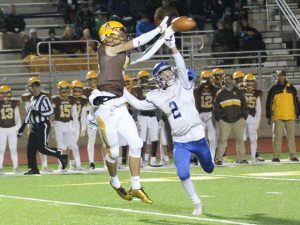 He found good yardage around right end, picking up 12 before Reece Collins (1) and Rifenberg teamed up to bring him down at the Highlander 39. On first down Tracy again ripped the Highlander defense, this time for 7 before Rifenberg brought him down. 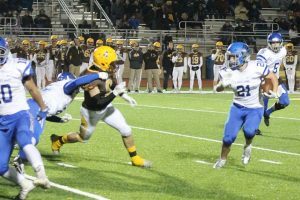 After a false start moved them back to the 37, Tracy ripped off 13 more yards; Rifenberg with another tackle. Then on first down from the Adams 24, Tracy got it going left and the Highlander defense got pinned in and gave up the outside edge. Tracy raced into the left corner of the north end zone untouched for a 24 yard TD. Bob Anderson (64) blocked the PAT, and it was 6-0 after Lakeland’s first possession with 4:50 left to play in the first. The Highlanders got it back 1st-10 from their 29. 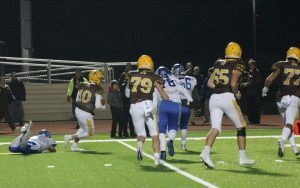 Farris ran read option left and ran between blocks of Conner Hess and Cole Mitchell (77) for a gain of 8. After an incompletion, Farris ran read-option left again. Hess again cleared out and Patritto made a nice down block to free Farris for big yards. He got a downfield block from Bishop and made a couple tacklers miss before getting hauled down after a 23 yard gain. 1st-10 at the Eagles 40. Anthony “Twan” Patritto got the next carry going around his left end. 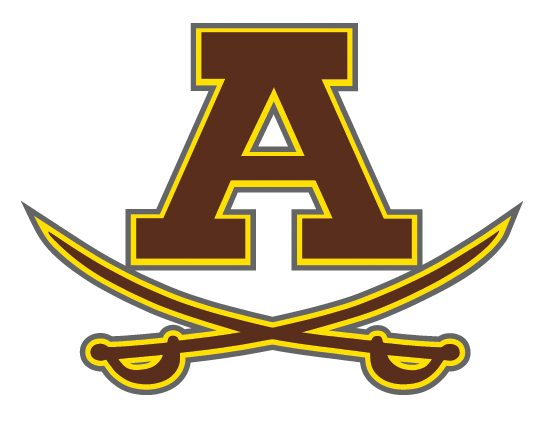 Tim Anderson (65), Bob Anderson (64) and pulling guard Reed Vogt manhandled defenders and Reece Collins kicked out the outside linebacker. Patritto cut up behind him for 13 yards to move the sticks to the Lakeland 27. After Patritto carried again for 6 yards, Traficante picked up 5 behind effective drive blocking by Tim Anderson, Reed Vogt, and Cole Mitchell. Farris was stopped for no gain. Then, on 2nd-10 from the 16, it was Patritto taking it again around the left side. 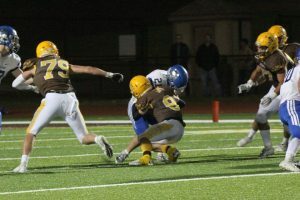 Mitchell pulled and took out the defensive end. 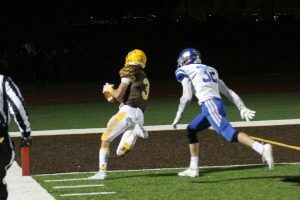 Bob Anderson folded the left side of the Eagle line inward and Patritto bounced it outside, around a great downfield block from wideout Collin Weeks (4), and into the corner of the south end zone for a Highlander touchdown. Ben Patton (18) knocked the PAT through the uprights and it was 7-6 Adams with 51 seconds remaining in the first. Lakeland’s second possession started at their 20. Their power back, 220lb Dakota Myers (47), got the first carry for 4 yards; Nick Kania (2) and big Cole Mitchell on the tackle. Myers got it again, this time for 5; Daniel French (54) and Patritto teamed up to bring him down. The Lakeland QB, Brady Woodruff (5) ran a QB sneak, and appeared to be short. Vogt, French, and Rifenberg clearly stuffed him behind the line of gain, the 30 yard line. His helmet never got there, so the ball couldn’t have got there either. Yet the ball was marked across the 30 to award a first down. The first down carry went to Tracy, who found room for 6 before Mitchell and French stopped him. Then the Eagles hit on their biggest play of the night. Myers got around contain on the left side and rumbled for 35 yards down the Lakeland sideline before Patritto and Kania knocked him down. 1st-10 from the Highlander 29. Rifenberg got help from French to tackle Myers on the first down play to limit the gain to 2. Mitchell and Tim Anderson brought down Tracy on the next play after a pickup of 6. It was Tracy again on 3rd-2 picking up 7 more to move the sticks down to the Adams 21; Rifenberg and Vogt on the tackle. Vogt made the next tackle on Tracy, stuffing him for no gain on first down. Jackson made the tackle on Myers on second down after a gain of 3. Big 3rd-7 play. Woodruff passed to Myers out of the backfield in the right flat, but Rifenberg was there to drop him after only 1 yard to set up 4th-6 from the 10. Then it appeared the Highlanders might have jumped offsides on the FG attempt. But as the Eagles sent their offense back on the field to go for an apparent 4th-1, the refs huddled to discuss. 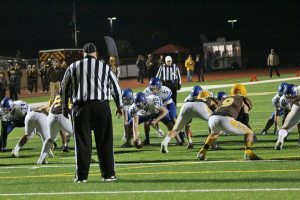 The Eagles, after coming set in two point stances, had hard counted to go to three point stances and snapped to position with a sharp motion meant to simulate a snap. Including the center who jerked his second had to the ball in the same motion. Clearly deceptive intent to draw Adams offsides. False start was called on the Eagles. A good call, which would be hard to come by on this night. They moved back 5 yards and again set up for a FG. This time, they went down normally from a 2 to 3 point stances at normal speed and the Highlanders stayed still. Leo Skupin booted it through from 32 yards out to make it 9-7 Lakeland with 6:37 left in the half. 12 play drive, but Adams was able to bend without breaking and limit them to 3. Highlanders ball on their 20. Swain carried for a yard. 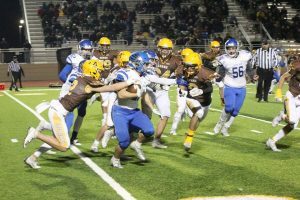 Then Patritto took the pass from Farris on a short out-route, broke a tackle along the Lakeland sideline, and took it for 9 yards to move the chains. Patritto carried for 6 on first down, then Swain was stopped for no gain before Collins was limited to 2 yards on 3rd-4. 4th-2 from their 38 and the Highlanders made the gutsy call to go for it. Collins got it going left off jet motion from his slot position. Collin Weeks, who lined up as a left tight end, sealed off the edge with help of Maurice Swain Jr. Collins cut under them and around the drive block of Bob Anderson for 8 yards and a Highlander first down at the 46. Carter Farris hit Patritto on the quick out to the right and Twan got around the right corner and down the Eagles sideline for a 13 yard catch and run. On 1st-10 from Lakeland 41, Carter put the ball on Patritto, who was open on a crossing pattern, but he couldn’t bring it in; incomplete. Patritto was playing with an injured shoulder. He separated it in the Harrison game, and it effected his ability to get both his hands up to catch this one. But the reason he was on the field despite being dinged up became evident the next play as Twan took the handoff around the left, got blocks from Mitchell and Collins on the edge, and split the brothers Anderson into the secondary. 13 yard pick up. Then, again from 1st-10 at the Eagle 28, Patritto got it on a quick pitch option play around the left side. 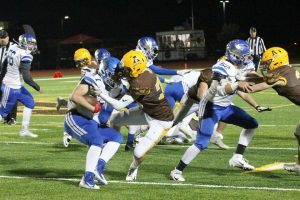 Reed Vogt got the hit on the play side linebacker, and Collin Weeks took care of the corner as Twan zipped around the left edge for 12 more yards. 1st-10 at the 16, less than 2:00 in the half, and Adams was rolling. Farris fumbled the read option fake to Swain Jr, but the ball bounced off of Reece Collins shoulder pad as he was making a block, right back into the hands of Farris, and he salvaged 3 yards on the play. On 2nd-7 from the 13, Farris tried to hit Jack Bishop on the post corner route, but the pass was just wide off his hands as he dove for what would have been an amazing catch in the north end zone. 3rd-7. Farris took the snap and looked to throw the slant to either Patritto or Pico on the right, but was flushed left out of the pocket. 6’4” 280lb. Eagle defensive tackle Nick Calderson (56) grabbed him around the waist at the line of scrimmage, but Farris took him for a 4 yard ride. Unfortunately, as Farris went down, Calderson landed on the back of his lower leg at the just the wrong time. In that horrific instant, the Highlanders lost both their QB, and their chance for an extended playoff run. Farris suffered a broken leg on the play. The crowd watched in stunned silence as their offensive leader and the key to the Highlander veer attack left on a stretcher. Ben Patton came on and drilled a 26 yard field goal to make it 10-9 Adams with 1:03 left in the half. Lakeland got it back on their 20. Tracy took the shotgun snap an passed to Auston Boughton (24) on a quick slot receiver screen. He made his way for 14 yards before French and Rifenberg dropped him. Then the big back, Myers, got it going again behind good blocking. He picked up 19 before Patritto took him down. Vogt and Mitchell teamed up to tackle Tracy after a gain of 1. Then Rifenberg stuffed Rossi for no gain. Rossi carried again on the last play of the half from the Highlander 46, but French stopped him after a yard. Lakeland ball to start the second half at their 20. Ryan Rifenberg and Twan Patritto combined on the stop of Tracy after he picked up 6. Then French brought him down after a 5 yard pickup. French made the next tackle as well, bringing down Myers after he picked up 6. Reed Vogt stepped with a big play on 2nd-4, tackling Myers for a loss of 1 to set up 3rd-5 at the 36. Tracy got the carry and picked up 7 to move the sticks; Bob Anderson and Logan Sayre brought him down. On 1st-10 from the 43, French made a big play as he stuck his helmet in Tracy’s chest for no gain and forced a fumble. The ball popped free and Logan Kania recovered it at the Eagle 41. QB Jerry Garrett (6) handed off to Swain Jr for a gain of 1 on first down. Then the snap got away from him and he had to run back and fall on it for a 12 yard loss. 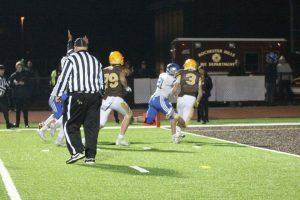 The third down pass was incomplete, and the Highlanders failed to capitalize on the short field. They punted on 4th-21 from their 48. Lakeland took over at their 14 after a 38 yard punt by Patton. Patritto brought down Myers after he rumbled for 10. The Eagles nearly coughed it up again as the ball hit the turf after a failed hand off to Myers, but Tracy was able to fall on it; loss of 5. Logan Kania tackled Tracy on the next play for no gain. 3rd-15 from the 19. They gave it to Tracy on a jet sweep right, but Rifenberg raked him down in the backfield for a 3 yard loss and it was again punt time for the Eagles. Adams ball with good field position again at the Lakeland 44 after a 41 yard punt and a 15 yard return by Collin Weeks. But another three-and-out was all they could muster. Garrett lost 2 yards on first down, then Patritto was stopped for no gain, and Garrett threw incomplete down the right sideline on third down. 4th-12 from the Eagle 46, and Adams elected to punt. Eagles got it back, still down by a point, at their 25 after a 24 yard punt by Patton. Rifenberg stood up Tracy and the line of scrimmage and Hess finished him off for no gain. Then Rifenberg and Sayre teamed up to stop Myers after a gain of 4. On a big 3rd-6 play, Rifenberg met Tracy in the backfield again. He spun him down for a loss of 3 and Lakeland had to punt. Rifenberg came hard off the edge and almost blocked the punt. After a good 50 yard punt and a personal foul penalty Adams started pinned back on the their 11 yard line. 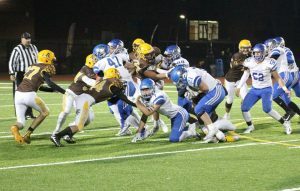 Collins gained 10 on first down around right tackle behind good blocks by Luke Toibiczyk (67), Conner Hess, and Anthony Patritto. Swain carried for 4 on first down. Then Garrett hit Weeks on a back shoulder pass, but the defender got his hand in there to break it up. 3rd-6 from their 25, and Patritto got the carry, but was swallowed up for no gain. Patton came on to punt, and after a false start moved the ball back to the 20, he booted it away. The 30 yard punt was high and when it came down it bounced straight up in the air. An Eagle player unknowingly ran right under it as he tried to throw a block, and the ball came down and hit him. 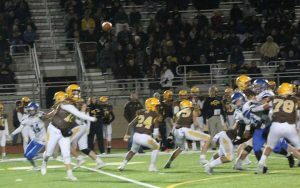 Jake Schuler (14), the long-snapper and first man down on punt coverage all season, was again right there and he made the recovery to extend the drive for Adams at midfield. Swain carried for 2 up the middle. Then Patritto delivered another big play. Adams lined up with dual wideouts to the left and ran jet action with Collins to the left. Garrett took the snap, faked left with a jab-step, then ran right to lure the unblocked outside linebacker in before he quick-pitched it to Patritto, who got free on the edge and into the clear. He got a downfield block from Bishop on the cornerback and took it 31 yards down to the Eagle 17 yard line. Patritto got it again and gained 3. Then on 2nd-7 from the 14, Nico Jackson turned in another nice run. Hess, Vogt, and Collins threw the key blocks that sprung Jackson for a 10 yard gain. 1st-goal from the 4. Cole Mitchell got the carry for a gain of 1. Then Patritto gained 2 down to the 1. On 3rd-goal from the 1, Collins punched it in between the blocks of Tim Anderson and Conner Hess. Patton kicked the PAT and it was 17-9 Highlanders. Lakeland ran their first down play from their 24. Tim Anderson and Jake Schuler teamed up to stuff Myers for no gain. Then Tracy got in the wildcat formation and looked to throw, but Sayre and Kania provided blanked coverage and he had to throw it away, incomplete. On 3rd-10 Rifenberg was in the backfield again to hit Tracy first, Logan Kania help finished him off. 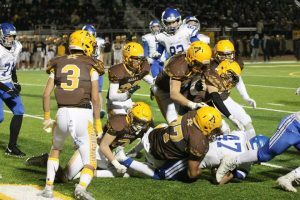 Loss of 3 to give the Highlanders the three-and-out stop they needed. Highlander ball on their 44 yard line with the chance to salt this one away. Garrett rushed for 4, then Collins ran for 4. As the Highlanders lined up and snapped the ball on a 3rd-2 play, whistles sounded. They called false start. But no one moved. Vogt got a good jump off the snap as he pulled, and Patritto was breaking into jet motion right before the snap, but no one had moved. Film confirmed it. Inexplicable call. 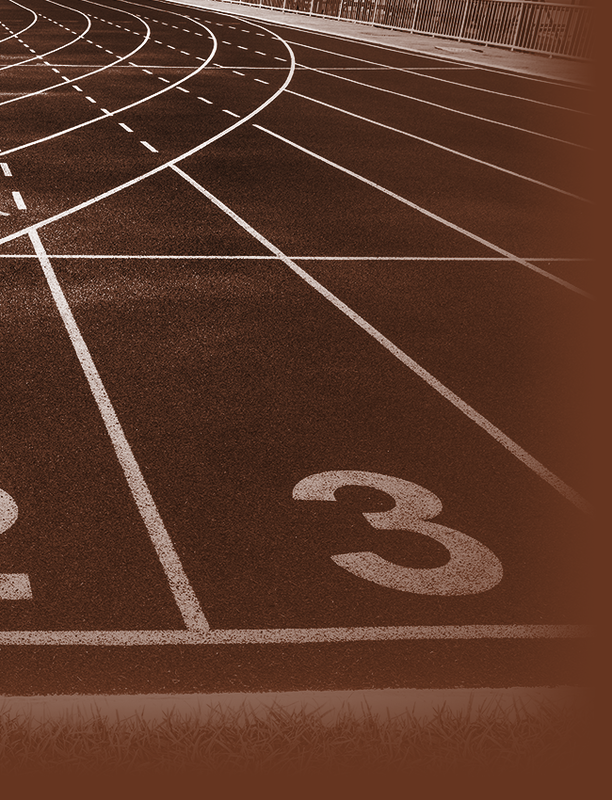 It was as if they got fooled and called Patritto, a legal motion man, for a false start. So instead of the relatively easy 3rd-2, the phantom motion penalty made it 3rd-7. 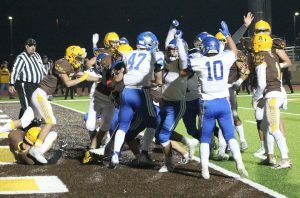 Patritto got it again, and just as he took the handoff, Eagle defensive end Ben Roberts, who had penetrated into the backfield, made a big play as he stripped the ball as he made the hit. Lakeland recovered at the Highlander 43. Tracy got the carry on first down, and again Rifenberg was there to stop him for no gain. Sayre and French did the honors on the next play as they stuffed Tracy after he gained 1. On 3rd-9, it looked like the Highlander defense was going to hold again after Woodfuff looked to pass and had to scramble for his life as he was pressured by Mitchell and Rifenberg. He leaped and heaved it downfield to avoid a sack, incomplete. But there was a flag on the field. They called Mitchell, who shoved Woodruff to the ground after he released the ball, for roughing the quarterback. Devastating call. The quarterback was out of the backfield and was a runner. 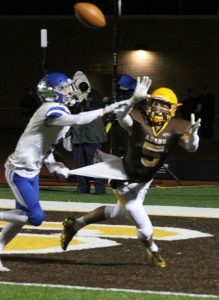 The hit was not late, Mitchell’s hands came into contact with him BEFORE the QB’s feet returned to the ground after he leaped to throw the pass. It was a clean play, but instead of 4th-9 back at the 42, they gave Lakeland a 1st-10 at the 27 with under 3:00 to play. Schuler and Nick Kania stopped Rossi after a gain of 3. Then it was Kania with help from Sayre to bring down Myers after a gain of 4. Huge 3rd-3 play from the Highlander 20. 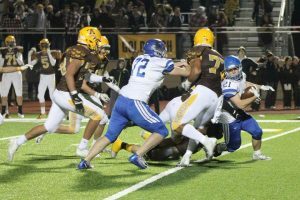 Tracy got it again, and again Rifenberg burst into the backfield tracking him for another loss, but he was clearly hooked by tight end Shaun Keller (82) who hooked Rifenberg’s right shoulder pad with his right arm 2 yards in the backfield. 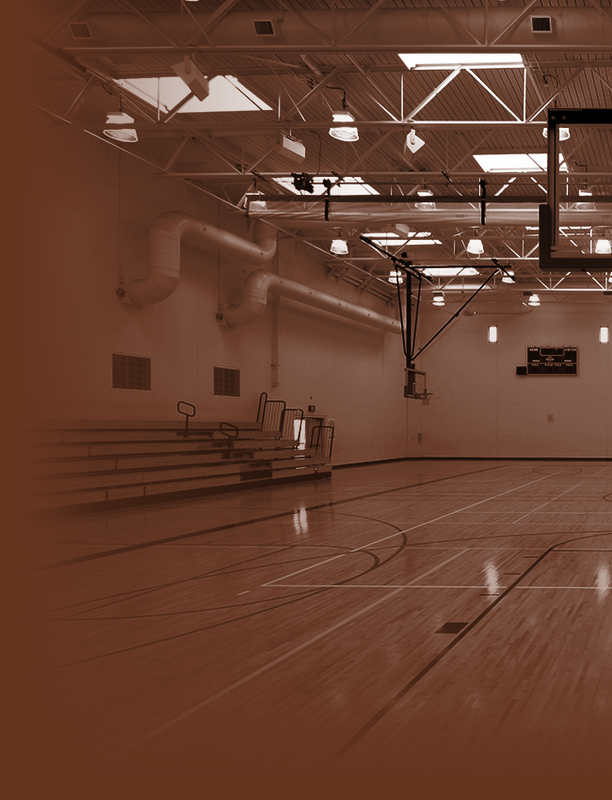 You could see it clearly from the top of the home bleachers in real time, and you can certainly see it clearly in the film. The linesman was right there looking right at it…and didn’t throw the flag. The flag-happy referee who made the roughing call also had to see it, it was right in front of him too. Easy and obvious holding call. But no flag. Tracy escaped to the left boundary out of bounds for a gain of 3 and a crucial first down. Instead of 3rd-15 from the 32, it was 1rst-10 from the 17. Logan Kania and French stopped Tracy after a gain of 1. French and Vogt brought him down on the next play after a gain of 4. 3rd-5 from the 12. Myers got it an bulled for 6 before French and Sayre made the stop. 1rst and goal from the 6 with a minute to play. Tim Anderson brought down Myers after a gain of 4. Then with 38 seconds to play, Tracy took it off right tackle for the score. They needed 2 to tie. Tracy got it again, this time slicing off left tackle, and he got in. 17-17 game. Adams got it back and ran Swain for 2 yards to send the game to OT. Adams got it first, overtime rules, on the Lakeland 10. Garrett kept it for a 1 yard gain on first down. Collins carried for 3. Then Garrett’s pass to Swain in the flat fell incomplete after Swain lost his footing. Ben Patton came on and booted a 23 yard field goal. 20-17 Adams. Lakelands turn from the Highlander 10. Tracy got the hand off going left. Rifenberg came on a weak side run blitz, dove at this feet in the backfield, but just missed him. 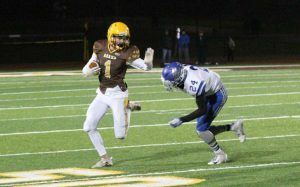 Tracy followed the lead block of Myers and his pulling guard into the end zone to end the Highlander season. 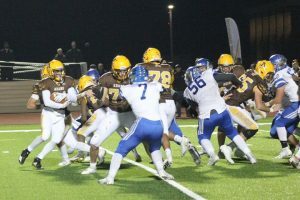 Tough loss to take as the Highlanders lost their starting QB and were unable to sustain any second half drives outside of the short field possession they cashed in on after the muffed punt recovery. But their defense stepped up and still put them in position to win the game. 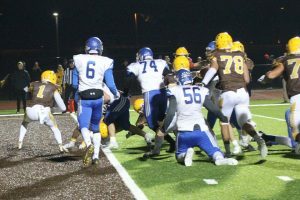 The unfortunate officiating decisions on the roughing call, and then no-calling the obvious hold on Lakeland’s tying final drive in regulation was just enough to put the dagger in them. Credit Lakeland for hanging tough, but its pretty clear there is no way they could have beat the Highlanders if Carter Farris played the whole game. The Eagles blocked great for their two talented backs Tracy and Myers, and were able to control the line of scrimmage when it counted. Adams had 250 scrimmage yards, 205 on the ground and 45 though the air. Lakeland had 240 scrimmage yards; 225 on the ground, only 2 pass completions for 15 yards. 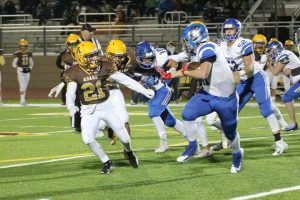 Robbie Tracy finished with 28 carries for 110 yards and two TDs. Dakota Myers had 14 carries for 101 yards. Junior Carter Farris rushed 7 times for 38 yards and completed 3 of 8 passes for 45 yards, all in the first half. He will recover and return as the best QB in the OAA Red next year. Junior Twan Patritto carried 13 times for 102 yards and a touchdown and caught 3 passes for 45 yards. He will be back next year as well as the Highlanders biggest offensive yardage threat. Senior Reece Collins carried 6 times for 28 yards. Senior Nico Jackson had 2 carries for 21 yards. Junior Maurice Swain Jr had 7 carries for 12 yards, he will be back and expected to contribute heavily next year. Sophomore Nick Traficante carried twice for 5 yards, he has two more years under the Highlander lights. 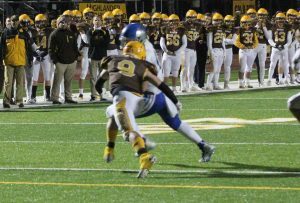 Senior Ryan Rifenberg led the defense with 16 tackles in his last high school game, 4 of them for a loss. Senior Daniel French went out with 13 tackles of this own and a huge forced fumble. Junior Logan Sayre and Senior Reed Vogt had 6 stops each. Patritto and Senior Cole Mitchell each had 5, and Senior Logan Kania, Senior Nick Kania, and Junior Tim Anderson all had 3 a piece. Things just failed to fall in place for them on this night. You either win, or you learn. Another life lesson in a game chock full of them. This team left everything they had out of the field every time they laced up their cleats for battle, and never failed to bring great pride to their school, their town, and their adoring fans. 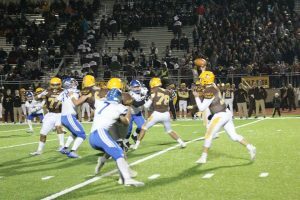 This 2018 team finished 6-4, but they were playing to win in the second half of every game they played….in the best high school football conference in the state of Michigan. They join the many teams that have come before them in a manner befitting the proud Highlander football tradition. 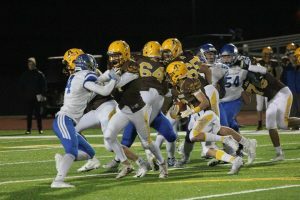 Their Hard Work and the lessons they learned now pave the way for the 2019 team, who will begin to add their own story to the Adams Football history books just 10 short months from now.